*As a Private group, the above Event link will only load for Facebook group members. Hang out with pals! Get rid of books! Acquire new ones! Appreciate literature! Look, most of us will be traveling + not working during Thanksgiving weekend, so you will DEFINITELY have time to read something. 5) Everybody is invited, even (especially) if you’ve never gone to a MaxFun NYC event before! Q: How many books should I bring? A: Anywhere from zero to a million. 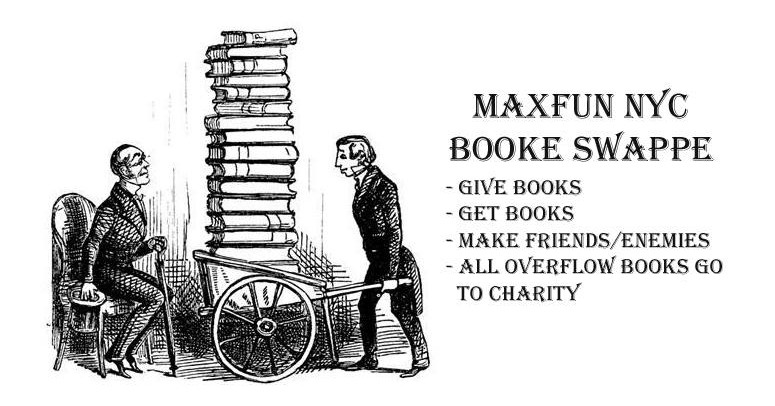 There’s no minimum requirement (bringing zero books is absolutely fine) and all leftovers go to charity, so it’s NBD. Q: What sort of books should I bring? A: Anything you think people will be interested in! Last time people brought and took home fiction, nonfiction, cookbooks, and comic books. Just make sure they’re in good condition – no heavy markup, no water damage, binding isn’t falling off, etc. Q: This sounds like lots of fun and a great way to hang out with some good people, discuss fine (and not-so-fine) literature, maybe have a drink or two, and generally just kill it on a saturday afternoon. A: Not a question, but yes that is correct.